Your home is your castle, it is mean’t to feel safe, secure, and free of all threats. Over the years of living in your home many keys are made for your set of locks. They are handed out to friends, loved ones, and service representatives; pool cleaners, landscapers, pest control technicians are the most common. Keys also get misplaced, lost or stolen, it happens to the best of us. Re-keying your locks is and effective way of securing your home from criminal activity, or keeping individuals from entering that you do not wish to have access. When you put your key inside the lock on your front door, it turns and unlocks the door. We all know that, but how does it really work? Well, the locks on your home have a combination inside unique to the working key for that lock or set of locks specifically. The key goes in the lock, the grooves fit the key cut, and the cylinder turns with the key inside. Those grooves on your key are cut specifically to match the small metallic pins inside the cylinder. Once the key is in the lock, these pins are then lift or lowered accordingly to create one flat line call the shear line that allows the cylinder to turn rather than be locked in place. As the cylinder turns, along with it the tailpiece in the back that retracts the latch to unlock the door. 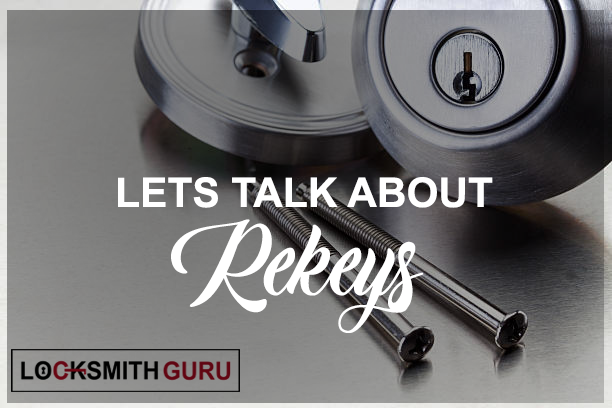 The act of having a lock re-keyed is when the lock is disassembled in the correct manner, and all of the pins on the inside are replaced to match a new working key. This process then disables use of the old key if desired, to allow the new working key to be the only accessible key to the specific lock this process. A pre-cut key or set of keys with the same cut are chosen as the desired working keys. They are then inserted into the cylinder with all of the old pins removed, and one by one the pins are matched up to fill the holes and create a flat line at the top of the cylinder. The cylinder is then re-inserted into the lock, reassembled, and installed back onto the door. Voila! The lock now works with a new key which can be duplicated for multiple copies; the old key will no longer allow the cylinder to turn and can be discarded.